Illinois needs a transportation system that meets the economic and environmental challenges of the 21st century. We need fast, affordable, and reliable ways to get around—not a system stuck in the past. Governor Pritzker and the Illinois General Assembly can take a big step forward by funding the Illinois Fast Track Initiative, a bold vision for a transit system that creates strong families and economies—and makes Illinois a leader in reinventing railroad travel and public transit in the U.S. It starts with a statewide plan for modernizing intercity trains, commuter trains, transit systems, and buses—and integrating them into a robust, connected network. A 220-mph high-speed trunk line will tie the statewide network together. Fast, frequent and reliable trains linking cities throughout the state to Chicago, Springfield and St. Louis. Catch a train in the morning, arrive in time for a 9:00 am business meeting, then be back home for dinner. Tell Springfield that you want fast trains in the capital bill! 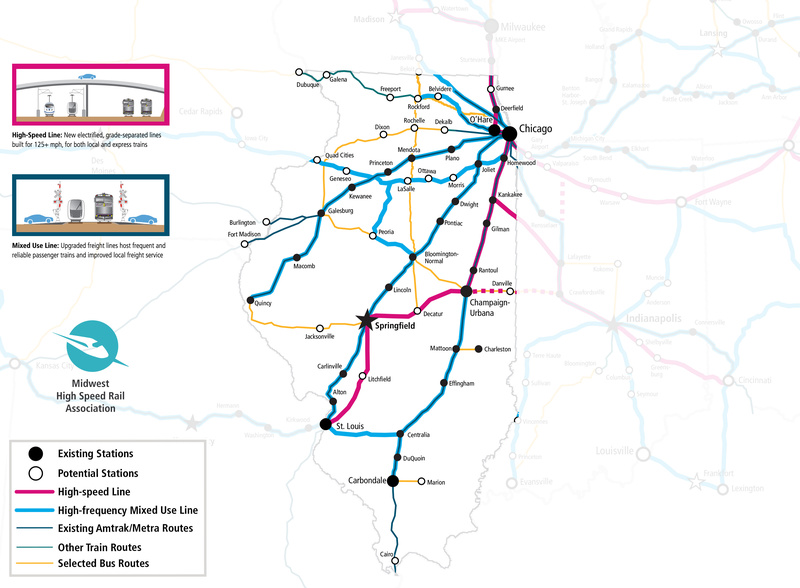 Illinois is the nation’s railroad hub. The Illinois Fast Track Initiative capitalizes on that strength and points us toward the future. It’s a plan for connecting the state’s major and mid-sized cities by high-speed rail. But it goes way beyond that. 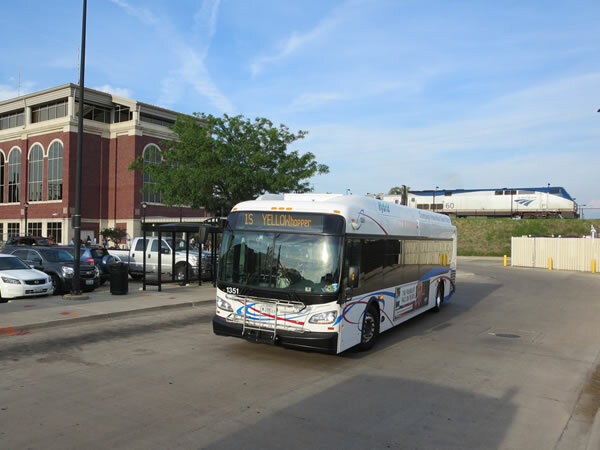 The Illinois Fast Track Initiative calls for modernizing intercity trains, commuter trains, transit systems, and buses—and integrating them into a robust, connected network. A 220-mph high-speed trunk line will tie the statewide network together. Each element will contribute to the whole. They’ll feed into each other and create a virtuous cycle of connectivity. It’s a game-changing way to think about travel—one currently used by California in its statewide rail plan. 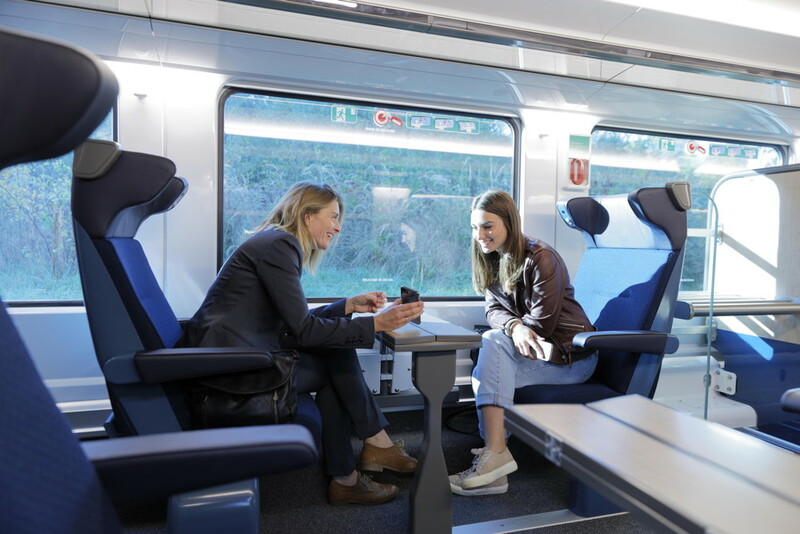 When high-speed rail, intercity trains, commuter trains, and buses are seamlessly connected, you can get nearly anywhere with ease, and ridership across the whole network multiplies exponentially. That’s why a big-picture plan for a statewide network is so important. The Illinois Fast Track Initiative gives agencies at every level a tool to think about how each piece of their system fits into the big picture. Then they can collaborate on investments that have a transformative impact. And that benefits local transit systems. Well-designed segments that work in harmony are used more, so they’re valued more. That means they’re funded and expanded. Vibrant local transit networks feed into the broader network, and vice versa. The virtuous cycle of connectivity becomes more powerful. The Illinois Fast Track Initiative will tie downstate towns and cities closer together, revitalize their urban centers, connect them to the state’s world-class universities, and make them more accessible and appealing to the kind of dynamic businesses that Illinois needs to attract. Riders will use feeder buses and trains to access the high-speed line. Each part of the system will play a key role in a broader network. The network will build political muscle as it proves its usefulness, in the same way that roads and bridges are well-funded because people rely on them. Moving to the next level will require the state to commit to big investments in tracks, stations and modern train equipment. Legislators will prioritize a modern transit network if—and only if—they know you support it. The General Assembly is considering a big transportation package (often referred to as “the capital bill”) that could fund the Illinois Fast Track Initiative—if representatives hear from people like you. Sign our petition to send a message to your local leaders, legislators and the governor’s office. Let them know you want a transportation network that works for everyone, in communities across Illinois.